100% silk, 5.0 mommes, 17.7" x 70.9"
The weight of silk is measured in mommes (mm), the weight in pounds of a 45 inch by 100 yards piece of material. The lower the mommes the lighter the weight of the silk, and the easier it is to nuno felt. These lustrous finished Habotai Silk Scarves are easy to nuno felt. These blank silk scarves are: 100% silk, 17.7" x 70.9", 5.0 mm, have a rolled hem, and are dyed in a rainbow of 30 vibrant colors. The weight of silk habotai is typically 5 - 16 mm. 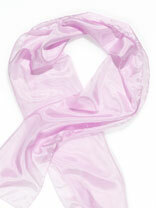 These blank silk scarves at 5.0 mm are a lustrous, lightweight, sheer silk fabric with a soft drape. Habotai is also known as Habutai, China Silk, and Pongee. The light open weave of this fabric and the fine long fibers of our wool roving are great for nuno felting because the wool fibers can easily work their way through the fabric and hold onto the silk. You'll enjoy nuno felting with these dyed blank silk scarves.